We’re excited for another great season of our summer camps and training programs! Designed to help athletes develop a love for sports and lifelong learning through volleyball. UNITY REPRESENTS AT PROVINCIALS WITH 8 MEDALS! 13U BOYS CLAIM PROVINCIAL GOLD! Congratulations to several of our rep teams who medaled at this years Ontario Championships, 12U Girls East and West teams, 13U Girls North, 14U Boys, 14U Girls North, 15U Girls West,16U Boys and our 13U Boys who took home the provincial title! ACADEMY SESSIONS RUN SEPTEMBER – MAY! Our indoor Academy programs are back for another season. Join us to begin or, continue, to learn the sport and train in an inclusive and supportive environment. Program details are listed below. The Unity Volleyball Club offers multi-faceted opportunities for volleyball skill development and personal growth to athletes of all ages and abilities. Through developmental and competitive programs, Unity coaches create positive environments where attention to process and learning are the primary objectives and athletes are encouraged to set personal goals and THRIVE together. 2017/2018 SEASON ENDS WITH 8 PROVINCIAL MEDALS! Unity Volleyball runs teams in multiple age groups for both boys and girls within the Ontario Volleyball Association. We encourage athletes who are not selected to a rep team to join one of Unity’s integrated programs like our Academy or High School House League to continue to develop their skills. Email Unity to set up a phone consultation to discuss your child’s goals in Volleyball and how we can help. The Unity Volleyball Club will be running summer training for rep volleyball athletes out of the Markham Pan Am Centre on Tuesday and Thursday nights for 8 weeks from June 4 to July 25. 2018/2019 programs are available. Our program is structured for athletes ages 8-13 to learn and continue developing their volleyball skills and physical fitness. These programs are highly recommended for those looking to try out for an OVA or even your school volleyball team. We’re excited for another great season of our summer camps! Our camps run from 9:00am – 4:00pm at the Markham Pan Am Centre and you can find details below. Last year our camps sold out so secure your spot now! The Unity Academy program is designed to improve the fundamental skills of athletes who have the goal of competing at a higher level. All skill levels are welcome, a positive attitude is a must. We operate Academy programs in Markham, Thornhill and Woodbridge locations. The Unity REP TEAMS program is a high-quality, competitive club experience. Unity teams compete in OVA and Volleyball Canada events. Rep teams practice a minimum of 2 times per week and compete in 4 or more tournaments between Sept. and May. All skill levels are welcome in Unity House League programs which are designed for high school aged athletes that want to improve their volleyball skills and learn to play volleyball in an inclusive but still competitive environment. 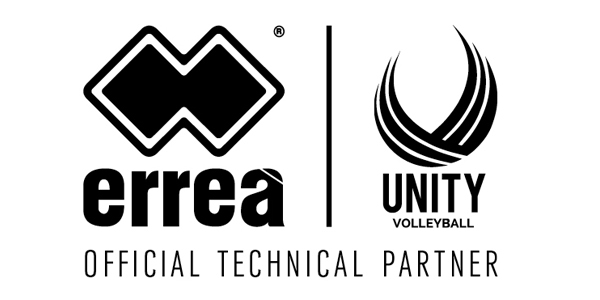 UNITY VOLLEYBALL IS PROUD TO HAVE ERREA CLOTHING AS OUR OFFICIAL TECHNICAL PARTNER FOR THE 2018/2019 VOLLEYBALL SEASON! Hoops and Spikes is a unique collaboration between two of Canada’s most popular sports, and takes a leading-edge approach developed by coaching experts and Canadian Sport for Life. The program develops physical literacy and basic sports skills using methods that encourage young players to learn through games and experimentation. We’d like to welcome Mettle Sports Training to our Unity Family this Fall!!! They will be working with all our teams as well as co-developing a cutting edge Physical Literacy program for the youngest athletes in the club.